Within the last month, I've become obsessed with Benefit Cosmetics. Before school got out for the summer, I visited one of Benefit's boutiques in Chicago (Armitage and Fremont) to pick up some "Foamingly Clean" facial wash that a friend suggested to me. After using the sample for a week, I had to brag about how much I loved this product to everyone I knew (sorry, Mom!). This is by far the best foundation I've ever used. 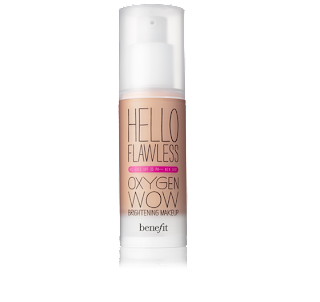 It's so light on my skin and blends in so well - it's more like a tinted moisturizer - and it comes in a variety of colors to match your skin perfectly. I use "Honey (I'm so money)". When I got back from my Florida vacation, I threw out all my old makeup and ordered all new makeup from Benefit. These products are magical; every new product I've tried has become a favorite. Although it's a bit pricey, these products last a very long time and are worth every penny. Because of Benefit, I look forward to my 10-minute makeup routine every day!